Writer Zeynep Ton argues workers who are paid fairly and treated respectfully are more productive and innovative. Barbara Gertz is 25 and works at a Walmart in Aurora, Colorado, stocking shelves on the overnight shift. She and her husband, a cement mason, can get by most months, but there have been days Barbara has called in sick because she can’t afford the gas to drive to work. 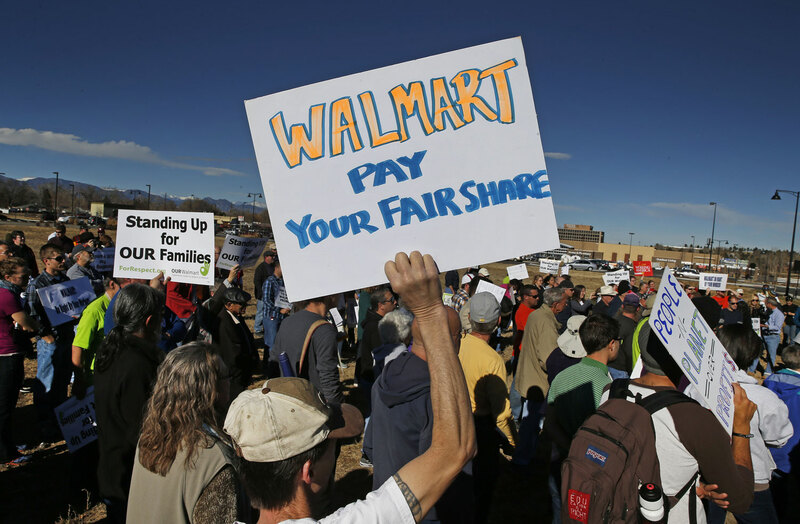 Higher wages would obviously benefit Barbara and her colleagues at Walmart who protested last Friday. They would also benefit fast food workers striking tomorrow in 100 cities across the country who earn, on average, $11,000 a year. But according to Zeynep Ton, an adjunct professor at MIT Sloan School of Management, higher wages are better for companies, too. Here’s one of Ton’s favorite examples of why the so-called Good Jobs Strategy works: During the recession, both Walmart and Mercadona, Spain’s largest supermarket chain, had to cut costs and did so by reducing the variety of products they carried. Walmart customers were annoyed when their local store stopped carrying their favorite brand of potato chip, or toilet paper or T-shirt. Sales dropped; Walmart’s chief merchandising officer had to leave the company. At Mercadona, customers were unfazed if an item they wanted was out of stock because workers, who as a matter of company policy are trained in every department, were able to recommend a replacement. Sales figures increased, even after Mercadona reduced its prices by 10 percent. Workers would let management know if there was a particular product that too many customers seemed to miss. “They could do this because they are empowered, cross-trained and have the time to engage the customer,” Ton writes. By comparison, Barbara told me that “there’s just a total lack of respect” for associates at Walmart. She mentioned a friend who politely pointed out an inventory problem to her supervisor and was fired the next day for the very mistake she tried to correct. Ton’s argument is that workers who are paid fairly and treated respectfully are more productive and more innovative, across industries and on all salary levels, at Google or at Walmart. “Low-cost retail work is not trivial and how you perform that work makes a big difference for the company’s bottom line,” Ton has written. Retail work requires intuition and charm, quick decision-making, a good memory. As Mike Rose, an education professor at UCLA, has eloquently written the intellectual rigors of low-wage work are too frequently dismissed. Ton’s Good Jobs Strategy also applies to fast food industry. In-N-Out Burger, the cultishly beloved West Coast hamburger chain, is a good example. The starting wage is $10.50 per hour, significantly higher than at McDonald’s. They have the lowest turnover rate in the fast-food industry. Like Mercadona and Trader Joe’s, In-N-Out keeps overhead low by limiting their offerings, by doing just a few things—hamburgers, cheeseburgers, milkshakes—really, really well. With more than half of fast food workers on public assistance, costing taxpayers an estimated $7 billion a year, the demands of Thursday’s strike is in the public’s best interest as well. On Tuesday, the Washington, DC, Council voted to increase the minimum wage to $11.50 per hour and to extend paid sick leave to tipped workers, having found, despite theories to the contrary, that such a policy does not discourage new businesses from opening or cause preexisting businesses to relocate. President Obama recently endorsed raising the federal minimum wage to $10.10 an hour. If political pressure and public protest don’t cause McDonald’s and Walmart to increase worker pay, perhaps pure profit-driven thinking will. After all, what if Barbara had to call in sick on one of the busiest days of the year? Fast food workers will walk out of stores in more than 100 cities tomorrow, Allison Kilkenny reports.